The Nigeria Union of Petroleum and Natural Gas Workers (NUPENG) Workers’ Council has commended the Union’s President, Comrade Williams Eniredonana Akporeha for his noble leadership role and for the milestone achievements he recorded within a short period of his assumption into office. The Council’s Chairman, Comrade Chinda Ejims on behalf of the staff stated this at the Union’s National Secretariat in Jibowu, Lagos on Wednesday (August 29, 2018) during a meeting with NUPENG’s management comprising of the President, General Secretary, Deputy General Secretary and Trustee, Comrade Adamu Song, Comrade Afolabi Olawale and Comrade Monday Osunde. “On behalf of the entire NUPENG Workers, we express our deep and sincere appreciation to the entire National Executive Council (NEC) under your noble leadership. 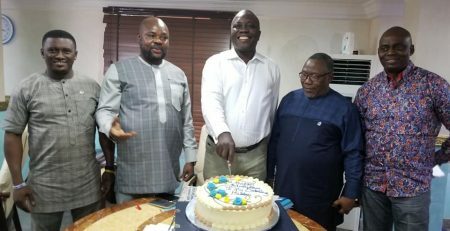 Sir, your magnanimity and milestone achievements within the period of your assumption into office and in particular, the strive to better and improve the NUPENG Workers’ condition of Service is overwhelming and commendable.” Chinda stated. “The entire Workers witnessed an unprecedented and unmerited promotion to some, all promotions were without any form of discrimination or victimization. 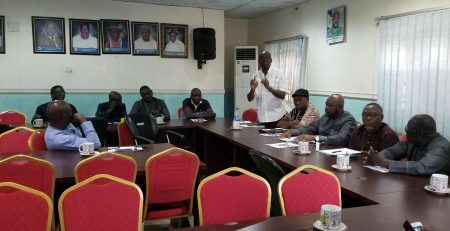 The Council however used the formal platform to also press home the workers’ demands in the areas of staff performance evaluation so as to identify aspects where training and development would be required for the workers in the overall interest of NUPENG. The National President of the Union on his part thanked the Workers’ Council for the trust and confidence they reposed in him since he took the mantle of leadership in April 2018. While reacting to the workers’ demands, Comrade Akporeha also tasked the workers to be disciplined, loyal, resourceful, and stand out as good Ambassadors of the Union in the course of their duties, even as he assured that all their demands would be looked into to increase productivity and efficiency.